A last-minute trip is always a stimulating experience as the preparations are kept to a minimum. Thanks to Internet speed, my ticket to the Canary Archipelago was booked 6 days before take-off. Departure from Bordeaux via Paris and Madrid, direction Tenerife, a destination stamped "mass tourism" for many Europeans. But the biggest island of the archipelago has for me an asset far away from the farniente and the nocturnal activities. I hope to find there something to satisfy my shellfish curiosity. On the eve of the departure, a glance in the volumes of European Seashells confirms that many of the most famous species are found in the waters of the Canary Islands. The archipelago is situated at the convergence of the malacological complexes of the North Atlantic, the Mediterranean and the North-West African, and its remoteness has favored a rather marked particularism. I also find a publication of the Spanish Ministry of Fisheries on the biodiversity of the archipelago, which mentions 96 endemic mollusk species or subspecies. 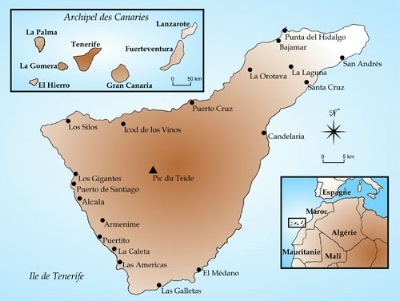 My journey takes place along the three coastlines of the island: from Bajamar to Buenavista for the north coast, from Los Gigantes to Las Americas for the west coast and from Las Galletas to San Andrés for the east coast. I am practically making the whole tour of this volcanic island which culminates at 3718 meters, virtually making of El Teide the highest peak of Spain. The coastline of Tenerife shows an alternation of sharp basaltic promontories, pebble beaches and small coves. Sandy areas are rare and most often artificially maintained by seawalls that stop the Atlantic waves. I quickly have some difficulties finding areas suitable for fishing by foot, especially since the tidal coefficient is small. Research on snorkeling is also limited on wavy days. The notes that follow are the results of hundreds of hours of field investigations. Travelers hurrying to find a beach and landing at Aeropuerto Norte most often head for San Andres and the clear sands of Las Teresitas. This is fancy seaside place for the healthy inhabitants of the capital Santa Cruz. The artificial wall protects a large swimming area whose depth does not exceed ten meters. Here, near the bottom lays the magnificent Nodipecten corallinoides fixed under the stones by its byssus and I am lucky to find a large dead specimen of 45 mm. The brightly colored shells are also represented by Haliotis tuberculata form canariensis, whose fishing is regulated, and Chiton canariensis which, as the epithet does not indicate, is also present in West Africa. A little closer to the surface, beneath the large concrete blocks, are some large Stramonita haemastoma and Cymatium nicobaricum. Following the east coast along the highway southbound, the beaches of mobile pebbles follow one another. This type of biotope is always moving with the waves and currents and displeases the majority of mollusks. The dark and smooth blocks become scarce in El Médano, where one finds the only natural beaches worthy of the name. The black and fine sands of the Medano and Tejita bays frame the Punta Roja, a hill made red by its vegetation. At his feet the low tide discovers a small flat of about ten meters in width, where the algae of shallow puddles retain sand and gravel. Here are many small Stramonita haemastoma, and I have not been able to determine whether it is a particular form of this polymorphous species or simply a concentration of juvenile individuals. I also find Patella ulyssiponensis, which is often found on the fish market and Patella candei form crenata with its beautiful bluish reflections. Patelliforms are also represented by the lunged Siphonaria pectinata. Finally, it is possible to encounter Erosaria spurca beyond the limit of low tide, nestled in small cavities covered with algae, and particularly the verdensium form which sometimes shows a tendency to melanism. The west coast benefits from a more generous weather than the north of the island and logically concentrates the most important touristic areas. Let us turn quickly to Los Christianos and Las Americas, marvelous examples of an anarchic coastal town planning that is less concerned about the erosion of biodiversity than the erosion of the euro. Further north, Playa Paraiso is less eccentric and hides a quiet and preserved place that bears the beautiful name of Puertito. This cove is reached by a road winding between the Euphorbias, and its miniature beach is framed by two rocky spurs. The site is therefore favorable to the burrowing species such as the beautiful Notocochlis dillwynii, the rare Bulla mabillei, Philippia hybrida and its concave operculum, or Nassarius cuvierii. I find also some Bittium reticulatum colonies, many of which have no growth ribs. Other small species such as Gibberula miliaria trifasciata or Mitrella minor are found in sand. More deeply buried in the substrate, always near Cirratulus worms, I find Turbonilla lactea with its diaphanous body and beautiful ribbed coil. Inside the gravel are a multitude of debris belonging to the deep-water Mathilda quadricarinata, a species rare in the collections and which could be probably found in numbers offshore Puertito. Road access along the west coast moves away from the coastline to Los Gigantes, which owes its name to the impressive rock formations that dominate the ocean north of the city. But before reaching this geological barrier I made some interesting observations in Puerto de Santiago. The seafront of this residential town is built on a rocky promontory not very suitable for fishing by foot, but extends to the north by a very pleasant footpath and a more welcoming intertidal zone. The place is home to several nudibranch and octopus. Passing a "blower's hole" very active during swelly days, one discovers an alternation of rock plateaus and beaches. Here can be found Coralliophila meyendorffii on Aglaophenia pluma, Gyroscala lamellosa on Anemonia sulcata and Trivia candidula on Didemnum coriaceum. In the rocky faults covered with algae live the beautiful Pollia viverratoides, which here take a dark blue hue, Luria lurida which wraps itself in its superb black mantle and Patella piperata with its sculpted shell. Finally, the puddles hide small Trochidae with very variable patterns.These are Gibbula candei and Gibbula spurca, which according to some authors is a variation of the first species. In practice, however, it is possible to separate specimens with a smoother overall appearance, more rounded towers, a generally more closed umbilicus, more dense patterns, and more streamlined shells with more spaced flame patterns. Once past the wild, almost uninhabited western tip of Teno, a stop at Los Silos gives an idea of he general configuration of the northern coast. Between the spurs of very sharp rocks are numerous small flat zones, not easy to access but which always have the advantage of presenting a rugged surface and a multitude of puddles at low tide. There are many rustic species, such as Cerithium vulgatum, which are difficult to find without traces of breakage or erosion, Cerithium rupestre which shows a certain variability of pattern, the countless Osilinus edulis and its less common cousin Osilinus atratus trappei. When the sun heats the black stones the hermit crabs and expose themselves. This is how I collect several Bursa thomae with lilac mouth and a superb Charonia variegata juvenile. Protected and banned from sale this species served as a trumpet for the Guanches and you can nevertheless find some in gift shops of Las Americas. Higher up, in the small rocky cavities, the colonies of Littorina striata flourish. Some young specimens adopt a tuberculate form that is confusing, but the tubers disappear during growth to give adults a regular smooth shell. The northern coast is not devoid of conchyliological interest, and I experienced the greatest joys in searching the coast of Punta Del Hidalgo. The most convenient access to this point is a dusty road from Bajamar, which runs alongside the banana plantations and leads to a surprising white lighthouse. Pelagic species such as Janthina janthina or Spirula spirula are rejected by dozens during the spring. Under the smooth stones, the colonies of Serpulorbis arenarius serve as a support for Cardita calyculata. The back of the rocks is also the diurnal habitat of some small Ocinebrina edwardsi, pretty Clanculus berthelotii, very colorful Nassarius incrassatus and many dark Mitrella ocellata. Nassarius pfeifferi prefers to slant slightly alongside Mitra nigra, which shows a gray-bluish shell when its periostracum is damaged. The fine gravels are home to Pinna rudis, tied vertically by a thick byssus to the rock and which sometimes hosts near its opening one or two Fossarus ambiguus. The green and red algae clusters are home to other small species such as Vexillum zebrinum, which can be uniformly black, Tricolia pullus turning orange, Micromelo undata with fantastic contrasts, or Irus irus which can develop beautiful foliations. The algae also hide the impressive Aplysia dactylomela, as well as Columbella rustica striata and Jujubinus striatus. Concerning terrestrial species, I could find numerous endemics in the hills north of Punta Del Hidalgo, making the research in the middle of thorny vegetation very motivating. Let me first mention the protected species Canariella giusti and Canariella planaria, which seem to live exclusively in the dead and decaying trunks of cacti, especially those of Opuntia dillenii. The beautiful Napaeus moquinianus takes refuge most often in the shade of Senecio kleinia, whereas the solid Hemicycla glasiana prefers the freshness of the rocky crevasses. Rock screes can also bring their lot with Monilearia phalerata and the very rare Gibbulinella dealbata. In conclusion, the island of Tenerife is not reserved for beach lovers and low-cost tourism but has a remarkable conchological interest. In the Canary Islands like everywhere else, the shell collector must behave responsibly not to add much harvesting pressure to the wild environment. Remember that sampling of mollusk populations in very small quantities, targeting only adult specimens in good condition, leaving biotopes in their original state and avoiding reproductive periods has a low impact on the marine environment. Note that the shells used for the photographs of this article were found dead, except for Chiton canariensis and Notocochlis dillwynii.